Since the introduction of the Hull Series back in April 2015, every new concept ship reveal has had an accompanying Q&A post, where we spend a couple days collecting questions from you, pass those on to the relevant ship designer, and provide you the best answers we have available at that time. With the addition of Spectrum eariler this year, we can now allow you to add your vote to the questions you most want to see answered. The questions included below are a combination of those that received the most votes, similar questions that were merged into a single instance, and those we felt we could comfortably answer at this stage in the Aopoa Nox’s life. With the Nox, not only is it concept complete but it is also far along into it’s development, with a hope to include it in the upcoming Alpha 3.0 release. While it is farther along than most ships for our Q&As, there are still some unanswered questions we’re currently pursuing in development. As the game continues to be fleshed out, those missing answers will be determined and implemented. While it will still be some time before we see the Aopoa Nox in game, we hope you’re as excited as we are as the game expands with the addition of another “space bike” to the Star Citizen universe. Also, don’t forget to check out Bugsmashers released earlier today with footage of the Nox in-engine and work being done on it’s pilot visibility. Work is still ongoing with continuing adjustments to both the pilot height and UI visibility, but we thought it was a fun chance to show you where things are right now. As always, a special thanks to Calix Reneau and Ben Lesnick for their help in answering your questions. Which ships will be capable of transporting a Nox? The most common question we get, and in this case our most upvoted, too! While we haven’t finished testing the Nox’s storage capability in every in-game ship, it can be used comfortably in a Freelancer, Cutlass (new) and Constellation. For smaller ships with cargo space like the Reliant & Avenger, it can physically fit but it cannot be secured. It’s not likely that will go well in practice, but we expect you to try it all the same and let us know when the Nox is added to the game. When in atmosphere, is the Nox a ground-only vehicle, or can it also fly at higher altitudes, across canyons, through clouds, etc. While the Nox will always has access to its multitude of thrusters, fighting gravity can be strenuous and ultimately unsustainable. Like the Dragonfly before it, the Nox can be used in space and on the ground, but it cannot make the transition on its own. For the purposes of operating down surface-side, it’s best to think of the Nox as a ground vehicle in this regard. When water/oceans are added to the game, will the Nox be able to speed across the water at a high enough speed? Yes. We thought about making a longer answer to this, but decided not to. Don’t you hate it when you get long-winded answers that can ultimately be summed up in just a single word? Brevity is the soul of wit, as they say. I don’t remember who said it, though. What is the max type of wearable armor can I wear while flying the Nox? This is a topic that affects all ships in Star Citizen. Currently, we are still evaluating what armors you’ll be allowed to wear when piloting any ship or vehicle in the game. How fast can the Nox fly in space? At present, the Nox has a top SCM of 220 and with afterburner can reach speeds of 550 in space. On the ground, that ratio is 40/100. 100 meters per second, 1 meter off the ground is pretty impressive. Does the Nox handle rough terrain any different or worse than the Dragonfly? Even though vehicles like the Nox and the Dragonfly before it hover over terrain, it will still have effects on its handling. In this regard, the Nox might not handle very coarse terrain as well as the more utility-built Dragonfly. 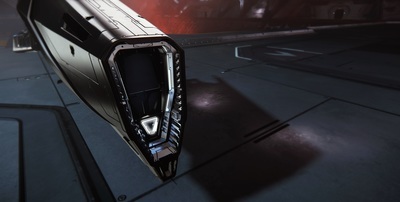 Does the Nox have a storage compartment for small items? It does not. The limited cargo capacity of the Dragonfly comes at the sacrifice of its rear passenger seat. The Nox is purpose built to get you where you’re going, with greater speed, and even greater style. Will we ever be able to paint our own ships? If so, what makes the Nox Kue limited? Can I store a rifle or any larger weapons on/in as it seems you can’t ride it with anything other than a pistol? Unfortunately no. Like a cave in the swamps of Dagobah, you have only what you take with you. Does it lean when it turns? Currently in testing, it will lean with you when you strafe, and when you are done with the yaw portion of the turn, you will continue to lean until you stop skidding. It’s pretty cool. Will the Nox be faster than the Dragonfly? Under ideal conditions, the Nox with its Competition-class components will give you a distinct advantage in races. That said, the Dragonfly may take the advantage over more difficult terrain. Choose your routes wisely. Will the Nox have upgradable components like shields and power plants? Vehicle-scale components are a relatively new addition to our ship item system. The Nox comes with Competition Grade C components. In the future, we intend you to be able to customize the components with higher grade Competition options. What other styles of components will be compatible with the Nox remains to be seen. How is the Nox “powerful in combat” as stated in ATV? When Chris Smith mentioned the Nox being “powerful in combat” on ATV, he was referring to its direct comparison with the other vehicle in its class, the Drake Dragonfly. While similarly armed, the Nox would seem to have the advantage in speed that allows you to chase down your targets efficiently, tremendous agility with its 16 maneuvering thrusters, and the added armor that protects its passenger more adequately from incoming fire. Will the Nox have stealth capability, or have access to stealth capability in some way? Stealth in Star Citizen is mostly about managing the emissions you make. In this regard, you will still have the same flexibility to manage your power consumption and overall signature as you will on any other ship. Additionally, you may find added benefit if you choose to replace your competition components with stealth items, but to do so would come at the cost of overall speed and performance. Does the Nox have landing gear, for when it’s powered all the way down? No, the Nox hovers at all times with emergency power. If you’ve drained even that, it will fall and be sad. Take care of your Nox. What makes the Nox almost as expensive and in some cases more than a spaceship with jump engine and quantum drive? Is this mainly a racer, or does it have other purposes i.e. ground combat? While primarily designed for speed, with its high maneuverability and S1 ship weapons, the Nox has a devastating potential in flanking slower and squishier infantry. Just don’t crash into things. Another major ‘game purpose’ of the Nox (and Dragonfly) that shouldn’t be understated is for traveling around our procedurally generated worlds. In a word, they’re BIG… so you’ll want a fast vehicle to traverse their surfaces and explore their mysteries. Can I gimbal the guns if I choose? or am I stuck with fixed? Like the Dragonfly before it, the Nox can only use S1 fixed weaponry. What distance can it travel on maximum speed? Standard SCM flight on ships doesn’t burn fuel in the sense we know today. With the technological advancements of 930 years, ships equipped with the proper intakes like the NOX can create and replenish the fuel necessary for everyday operation. In this way, you can travel at maximum SCM speed for extended periods of time. For afterburner speed, you will still have a limited amount of fuel as with any other ship. If the Nox loses power, would we be trapped in our seat by the articulating back plate? Presently, the back will articulate anyway, although it’s an interesting idea that might warrant a unique animation for such an event in the future.